From left - Chris Lavelle, Aidan Carlin, Patrick Lynch, Lawrence Devlin, Kate Crossan, John Deery, David Ferguson. Missing from photo Andrew Ferguson and Frankie Lavelle. Where there's a will there's a way! Midweek weather was rainy and less than perfect for grass strimming and, being honest, the best we hoped for was having just a quarter of the site ready in time for Saturday's community effort. However on Thursday two local lads, Andrew Ferguson and Lawrence Devlin, came, saw and conquered the tall wet grass in its entirety. It transpired that some of Andrew's ancestors are buried in this historic graveyard and he has been quietly acting as caretaker of the site for some time, keeping the grass at bay. Today the weather was more favourable. Nine individuals volunteered their services and the end result left the graveyard ready for mapping. As we raked and disposed of the grass-cuttings it became apparent that this survey wouldn't be nearly as straightforward as first anticipated. So it was decided, for today, to concentrate on preparation. Having been in use as a Christian burial site since at least the 7th century, it seems that parallel rows weren't in fashion throughout this time, or maybe it was simply the case that gravediggers had to work around subsurface rocks as they appeared. From a mapping perspective it offers a considerable challenge although one individual, John Deery, gave us hope as we discussed the task ahead stating "You know how the mouse ate the elephant?...One bite at a time." Small cairn of stones, an interesting feature. Having Andrew on-site today again was a bonus as his knowledge of the graveyard proved invaluable. For instance, a depression which, last week, we assumed to be a collapsed grave was in fact once home to the root-bowl of a tree which came down during a storm some years ago. In doing so, the same tree tumbled a Celtic cross headstone, which we had mistakenly taken to be the result of vandalism. Around lunchtime, young Chris Lavelle arrived with his drone and cameras. He has offered to make a promotional video for the main project (St Mura's cross and church gable conservation). We were cautioned to appear oblivious to the buzzing overhead and the cameras at ground level. This we managed quite well because, as luck would have it, the chief archaeologist for the St Mura's cross project, Kate Crossan, popped in to offer advice and guidance on the graveyard survey. She gave us a pep talk on the DOs and DON'Ts and potential of our survey, and left everyone feeling quite enthused about it all. By afternoon the site began to reveal its secrets piece by piece. For example, simply raking the grass would intermittently uncover random graveslabs which in turn helped make heads and tails of associated stones. Un-inscribed graveslabs revealed themselves during grass raking. Last week, a local historian, Dessie McCallion, stopped by to point out a couple of artefacts from the early days of St Mura's monastery which had been recycled as headstones. These appear to be a Holy water font, and a holed stone. It is not uncommon to find concave bullaun stones in the vicinity of early Christian sites in Ireland but they are not found solely at Christian sites. It would appear the practice of honing a concave dish into stones harks back to earlier religious traditions and was carried through into Christian times. Holed stone, reused as headtone. The graveyard continues to intrigue as today a Saddle Quern, recycled as a grave-marker, was discovered by John. 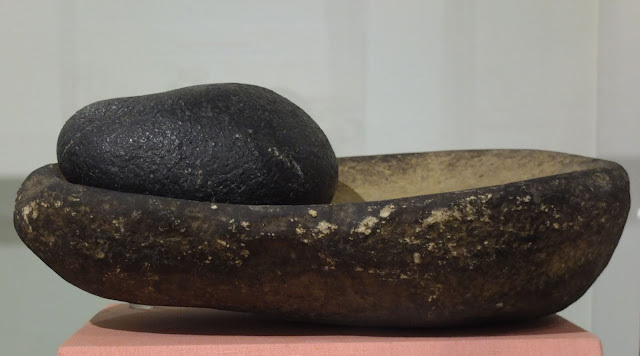 Saddle querns were used, since the Neolithic, in conjunction with a smaller, hand-held, stone for grinding grain, and generally they predate the hand-driven rotary quern. Considering the fact that, frequently, settlement and ritual sites in Ireland appear to have evolved through the ages we might also speculate that the site of St Mura's monastery had been occupied for thousands of years. Saddle quern, recycled as grave marker. Even though these artefacts are situated out of context, fulfilling jobs never intended, like a book under a shorter table leg, they add to the character of the ancient site. They hint at stories and changes through the ages. The survival of these features in situ is testament to the respectful attitude of the Fahan community towards their own local heritage. As a nation we are beginning to collectively understand and appreciate the 'Look but don't touch' advice from the archaeological authorities. If these items were to be removed by a member of the public, little by little St Mura's would become just another graveyard, like the mouse eating the elephant.